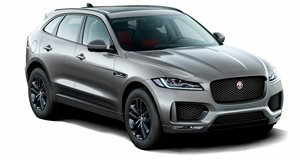 Forget the Macan, the Jaguar F-Pace dominates the sports SUV segment from bottom to top. A 2.0-liter turbo 4 can be had in outputs of 247 hp and 296 hp, while a turbo-diesel of similar displacement offers 180 hp, but vastly more torque. The F-Pace S gets a 3.0-liter supercharged V6 from the F-Type to the tune of 280 hp. 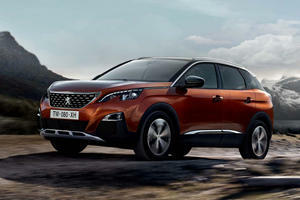 All models feature a rear-biased all-wheel drive system and an 8-speed automatic gearbox. The R-Sport trim offers sporty appearances, and offers the widest range of engine derivatives on one trim. The F-Pace features forward collision warning and lane keep assist among other safety features. 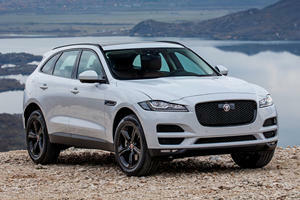 Jaguar is in the SUV game now – it feels very strange typing that out, but it’s true. The F-Pace might be their first attempt at a high-riding model, but even the shortest stint behind the wheel is enough to convince you they’ve been doing this for a while, and with Land Rover being conjoined, it’s fair to say they have. With one of the broadest engine ranges of any individual model in the USA, there’s also an F-Pace for any buyer’s needs – but one thing they all have in common is that the F-Pace is one of the best driver’s SUVs around. Based on the same platform as the Jaguar XF (hence the F in the name), the interior is one that feels incredibly familiar. That means a mix of some incredibly well crafted materials with piano black plastics that feel too cheap for a brand with Jaguar’s levels of prestige. But the seating position is exceptional, with a range of seat and steering adjustment making it easy to find a commanding position with good visibility. A few ergonomic faux pas are to be found, like the window controls mounted high on the window sill – but the decently intuitive infotainment touch screen and available digital instrument cluster counter the minor problems sublimely. Space is premium, and against its key rival – the Porsche Macan – the F-Pace makes the Porker feel like a toy car inside. Against the likes of the new BMW X3 though, the F-Pace is marginally less spacious; though not enough to complain about. Gas or diesel, base trim or range-topper, it doesn’t matter – every single Jaguar F-Pace can dance! That’s right, this is a ‘sports SUV’ that actually backs up the name across the range with sublime handling and chassis balance more akin to that of a sports car than a high-riding SUV. The rear-biased all-wheel drive system ensures there’s grip when you need it, but a traditional RWD balance when you’re hooning – even allowing oversteer on command. The steering is syrupy smooth and gorgeously weighted – communicating deftly what the front wheels are doing and how much grip is available. But it’s the supple suspension that deserves the most praise – comfortable and smooth on rough roads, but providing exceptional body control when cornering. It matters not whether you’re on the base 18-inch alloys or optional 22s, the ride is supple and exceptionally damped without being overly soft. A range of engine offerings encompass both petrol and diesel tastes. A 2.0-liter turbo 4 cylinder can be had in outputs of 247- or 296 horsepower, with 269- and 295 lb-ft of torque respectively. A 2.0-liter turbo diesel 4 cylinder offers 180hp, but bountiful torque of 318 lb-ft. 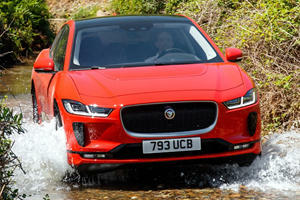 However if it’s performance you’re after, the snarling F-Pace S equips the 380hp, 332 lb-ft supercharged 3.0-liter V6 from the F-Type sportscar – enough for a 5.1 second 0-60mph time. All models make use of a rear-biased all-wheel drive system, and feature the exceptional 8-speed automatic gearbox from ZF. Six trims exist, all decently well specced. The base model features amenities like a power liftgate, power controlled seats, and a panoramic sunroof, while moving up to Premium gets you bigger 19-inch wheels, a rear-view camera, and optional blind spot monitoring. The Prestige adds full leather upholstery and power adjustable steering. R-Sport includes 20-inch alloys, R-Sport design elements, and sportier seats. The S gets you full on S styling and adaptive dampers – optional on other models. The Portfolio model is similarly specced, minus the sporty appendages. Safety features available include blind spot monitoring, a heads up display, and front and rear park sensors. So many model derivatives; and every single one of them oozes style and offers superb driving dynamics. If this is a sports SUV, then maybe the segment isn’t so bad after all. The F-Pace S might be expensive and thirsty, but it’s an F-Type on stilts; what’s not to love? New tech updates have inevitably hiked up the price for the Jaguar F-Pace. There's new electric tech available. So, which companies are for sale?